Apple today also introduced the new 7.9-inch iPad mini, a major upgrade for iPad mini fans who love a compact, ultra-portable design packed with the latest technology. With the A12 Bionic chip, the new iPad mini is a powerful multi-tasking machine, delivering three times the performance and nine times faster graphics.3 The advanced Retina display with True Tone technology and wide colour support is 25 percent brighter3 and has the highest pixel density of any iPad®, delivering an immersive visual experience in any setting. And with Apple Pencil1 support, the new iPad mini is the perfect take-anywhere notepad for sketching and jotting down thoughts on the go. The new iPads are available to order starting today and in stores next week. Apple Pencil and iPad — The Perfect Pair: Apple Pencil opens up new creativity and productivity possibilities for iPad mini and iPad Air users, from drawing and writing down thoughts to marking up documents and retouching photos. The must-have tool among students, professionals and creatives delivers a remarkably fluid and natural drawing experience and provides pixel-perfect accuracy and low latency for activities within popular apps including Procreate, Notability, Pixelmator Photo (coming soon) and Microsoft Office. Power Meets Portability with the A12 Bionic Chip — The Apple-designed Neural Engine of the A12 Bionic chip powers the next generation of apps and iPad workflows using advanced machine learning and Core ML® for engaging AR experiences, photo-realistic effects in 3D games and stunning graphics performance within apps. Advanced Cameras for Stunning Photos and Videos — With advanced front- and back-facing cameras, iPad mini and iPad Air take gorgeous photos and capture clear and stable 1080p HD videos. The upgraded cameras with exceptional low-light performance and HD video recording are great for document scanning and connecting with friends and family on Group FaceTime® calls, and with advanced sensors, help enable immersive AR experiences. More Than a Million Apps Just for iPad — The App Store® is the best place to discover more than 1.3 million apps designed specifically for iPad7 — from journaling with Apple Pencil to managing schedules and finances, editing photos, learning, connecting with friends and family, and playing games. Unlike stretched-out phone apps on other platforms, apps designed for iPad run and look great on every iPad. iOS on iPad — iPad Air and iPad mini are perfect for staying productive on the go with iOS, helping users get things done faster with features like Siri® Shortcuts, photo search and Voice Memos. The Dock provides quick access to frequently used apps and documents from any screen, and multitasking is easy with Split View and Slide Over. Drag and Drop makes moving images, text and files between apps easier than ever, and managing documents in the Files app is seamless and easy on iPad and across Apple devices. 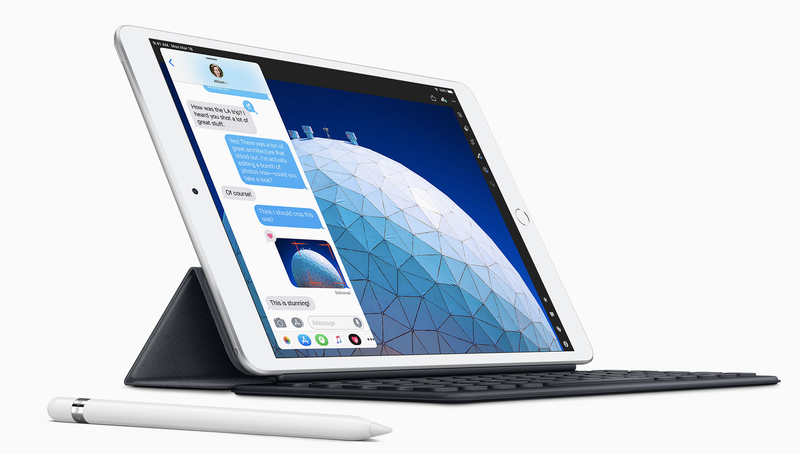 The Best, Most Complete iPad Lineup Ever — The new iPad Air and iPad mini join the most affordable 9.7-inch iPad and the most advanced iPad Pro® models, offering the best, most innovative iPad lineup ever. The complete lineup now includes Apple Pencil support, best-in-class performance, advanced displays and all-day battery life6 for an experience unmatched by any other device. Whether customers prioritise portability, screen size, power or price, there’s an iPad for everyone. Learn more about the iPad family at apple.com/nz/ipad/compare. The new iPad mini and iPad Air come in silver, space grey and gold finishes in 64GB and 256GB configurations. The new iPad mini starts at RRP NZ$679 inc. GST for the Wi-Fi model and RRP NZ$899 inc. GST for the Wi-Fi + Cellular model and the 10.5-inch iPad Air starts at RRP NZ$849 inc. GST for the Wi-Fi model and RRP NZ$1069 inc. GST for the Wi-Fi + Cellular model from apple.com/nz, in the Apple Store app, and is also available through Apple Authorised Resellers and select carriers (prices may vary). The new iPad models are available to order starting today from apple.com/nz and in the Apple Store app in Australia, Austria, Belgium, Canada, Czech Republic, Denmark, Finland, France, Germany, Hong Kong, Hungary, Ireland, Italy, Japan, Luxembourg, Netherlands, New Zealand, Norway, Poland, Portugal, Singapore, Spain, Sweden, Switzerland, the UAE, UK and US. Starting next week, the new iPad models will be available in those countries and regions, as well as in China (Wi-Fi models only), Macau (Wi-Fi models only) and Mexico with more countries and regions to follow soon, including Colombia, Greece, India, Israel, Russia, Saudi Arabia, South Africa, Thailand (Wi-Fi models only) and Turkey. Apple Pencil (1st generation) is available for purchase separately for RRP NZ$159 inc. GST. The Smart Keyboard for the 10.5-inch iPad Air is available for purchase separately for RRP NZ$259 inc. GST with layouts for over 30 languages, including simplified Chinese, French, German, Japanese and Spanish. Polyurethane Smart Covers are available for RRP NZ$75 inc. GST for iPad mini and RRP NZ$95 inc. GST for iPad Air in charcoal grey, white, pink sand and a new papaya, with additional Leather Smart Covers available for iPad Air for RRP NZ$129 inc. GST in black, saddle brown, midnight blue and red. Trade in your eligible device for credit toward your next purchase, or get an Apple Store Gift Card you can use any time.8 If your device isn’t eligible for credit, Apple will recycle it for free. Every customer who buys iPad from Apple can enjoy free Personal Setup online and receive guidance on how to customise their iPad, set up email, find new apps from the App Store and more. 7 App count refers to the total number of apps worldwide. 8 Trade-in values vary based on the condition, year and configuration of your trade-in device, and may also vary between online and in-store trade-in. You must be at least 18 years old. In-store trade-in requires presentation of a valid, government-issued photo ID (local law may require saving this information). Additional terms from Apple or Apple’s trade-in partners may apply.